Most of the time, when the subject of Washington wines comes up, the first question I get is: how do winemakers deal with all the rain? It’s an understandable question, given Seattle’s reputation as the City Where the Sun Don’t Shine, but it also displays the general ignorance most wine lovers have about my home state. Given that Washington is the second-largest producer of wine in the country, across a wide range of styles and quality levels, it’s probably a good idea to know that, say, the Cascade Mountains form a massive barrier, keeping the eastern portion of the state, where the bulk of the vineyards are, very dry. Like many other New World wine regions, the initial winemaking style was largely geared around ripe, extracted, oaked expressions of well-known “international” varietals. While grapes like Chardonnay, Riesling, Syrah, Merlot, and Cabernet Sauvignon still make up the bulk of the plantings in the state, grape growers and winemakers in Washington have a certain freedom that their neighbors on the West Coast envy. Part of this is sheer economics. The cost of land in Napa Valley or the Willamette Valley is quite a bit higher than in Washington, which serves to discourage innovation: at the prices Napa grapes command, there’s really no sense in growing anything other than the few commercially-viable varietals we all know: Cabernet Sauvignon, Merlot, and Chardonnay. Lower land costs in Washington have given grape growers and winemakers the freedom to experiment with different varietals, winemaking techniques, and growing areas and climates. The heart of the growing region is the Walla Walla Valley, and nearby Red Mountain. The first plantings of vinifera grapes in the 1950s and 1960s were made here, and much of the finest wine still comes from the highly regarded Walla Walla, Red Mountain, and Yakima Valley AVAs. Bordeaux and Rhone varietals are grown in abundance and to great effect here, along with a growing number of Italian and Spanish grapes. Many of the most prominent wineries in the state, names like Leonetti, Quilceda Creek, L’Ecole No. 41, Woodward Canyon, Abeja, and Cayuse, are either located in Walla Walla, source their fruit from the valley, or both. Washington’s combination of hot, long days and much cooler nights allows grapes to achieve a high degree of ripeness while preserving a core of acidity that can be lacking in other warm climates. Add to that a growing number of experienced winemakers and grape growers working with vines that are 20-50 years old, and the quality of wine coming out of the region has never been higher. While the Washington wine industry might have gotten its start in the hot and fertile Columbia Valley, much of the most exciting wine being made in the state now comes from more marginal growing areas. With increased demand for cooler-climate wines, sites like Lake Chelan, Snipes Mountain, and especially the Columbia Gorge have seen increased plantings across a wide range of varietals. In fact, browsing the Washington shelves at a Seattle wine shop sometimes feels like taking a miniature trip through Europe: Albarino, Gruner Veltliner, Picpoul, Mourvedre, and others sit proudly alongside Syrah and Sauvignon Blanc. Sauvignon Blanc Growing In Washington’s Columbia River Gorge. Of course there are a few challenges that face the Washington wine industry as well. Since the eastern part of the state is extremely arid, most vineyards rely on irrigation for a large part of the water that reaches the vines. Controlled drip irrigation is the norm, which allows for precise applications of water at the desired time, but the water rights issue remains contentious, though grape growing typically requires less water than other agricultural pursuits. The bigger challenge is finding a market for the wines outside of the state. Napa specifically and California in general have done an excellent job of claiming the bulk of the wine sales throughout the U.S. and overseas, while Oregon has the benefit of a specific varietal – Pinot Noir – as its calling card. 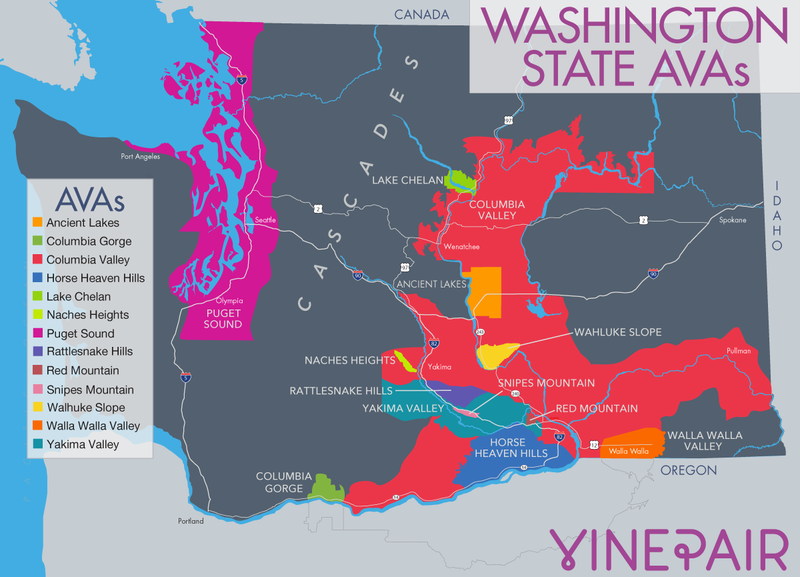 Washington wines, though diverse and often of very high quality, don’t have a similar cachet. The Washington Wine Commission has tried to push several red varietals over the last few decades, namely Merlot and Syrah, to mixed success. To date, it’s a bit tricky to find Washington wines throughout the country, and most of what is found comes from a few major producers (Chateau Ste. Michelle, Columbia Crest). That said, talk with the proprietor of your local wine shop, or take matters into your own hands: wine can be shipped from Washington to most other states. Or come out here and visit: I promise you’ll stay surprisingly dry. Zach Geballe is a wine writer and educator based in Seattle. He’s also a certified sommelier and once made Al Gore a martini. Do You Have To Open That Bottle Of Wine A Guest Brought To Your Home?